APP’s Epoxy Adhesive (EX-100) is a flexible, two-part, epoxy with high overlap shear strength. It was developed for aerospace applications and is specifically formulated to bond lightweight composites to metallic materials. It does not become crystalline, is resistant to chemicals, shocks and extreme temperatures. It is certified for industrial, aircraft and aerospace applications and meets ASTM E8 specification. APP’s epoxy adhesive is used to form a perimeter seal around our ProTek Wear Pads (pictured here), ProTek Flat Plate and CryoTek Pipe Shoes to ensure a secure bond and seal. In addition to flexibility, the epoxy features a high shear and peel strength. The tip of the static mixer expels the two-part epoxy in the perfect 1-to-1 ratio. 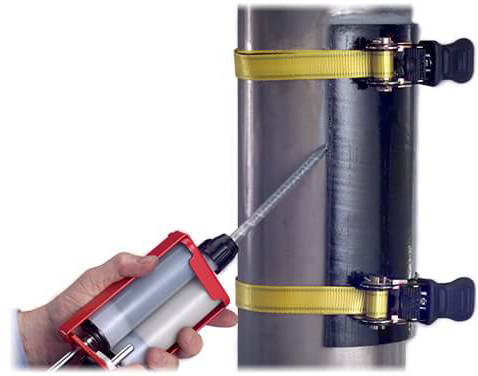 The applicator removes issues with human error and cleanliness and will allow for a consistent installation every time.